There's no need to get hot under the collar about barbecue costs this summer; a few DIY fixes will help you save money without sacrificing your cook-off. Instead of buying a barbecue, you can build your own, longer-lasting model for a similar cost. All it takes is enough bricks and cement to make two small walls, leaving shelves for a metal charcoal tray and the grill. iFood.tv have detailed instructions if you need further guidance. Alternatively, you could salvage old barbecues by giving them a good scrub and using foil to cover any rust holes in the bowl. It's cheaper and more environmentally friendly than a disposable, and will last at least another summer. If you don't have one of your own, try finding one on the Freecycle Network. Expensive bottles of branded sauces and condiments are great if you want to show you've splashed out, but if you're on a budget you can easily whip up your own. Seasonings can be customised from a salt or pepper base, with herbs like rosemary, thyme and cumin added to taste. If you have your own herb garden, now's the time to use your homegrown ingredients. For sauces, use tomato sauce or mayonnaise as your base and mix with a careful selection of cayenne pepper, mustard seeds, paprika or turmeric. It'll save plenty of pennies, and if you get it right you'll also get kudos from your foodie friends. Fire lighters are an expensive addition to your barbecue armoury. A well-aerated pile of charcoal can easily be kindled using balled-up paper from your recycling, but your options don't end there. If you have a tumble dryer, the lint trap contains a hidden hoard of kindling just waiting to be dried, balled and burnt. Cotton balls can also be daubed with Vaseline to make handy little fire starters or, for a more natural approach, dried moss from the garden works just as well. Once you've decided where to scrimp and where to splurge, make a strict budget to ensure you don't leave anything to chance. Make the most of Money Dashboard's free money management software to view all of your accounts, income and monthly spending, and to assess how much you can afford. Once you're decided on how much to spend, cost the meats, drinks and accessories online to ensure you don't overspend in store. If you can, save by buying in bulk and freezing any excess food for later. 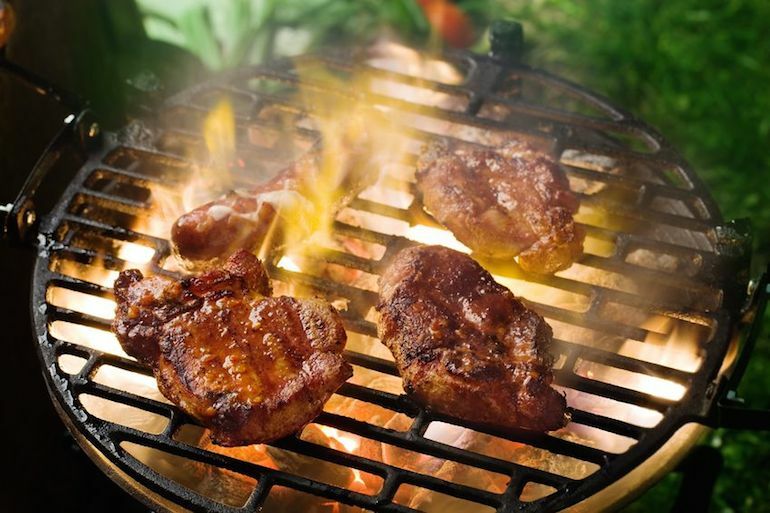 Once your barbecue's gone with a bang, don't neglect your equipment. After removing the coals, clean the surface and grill down with warm, soapy water, being careful not to chip any of the chrome plating because that's what's protecting the rust-prone steel underneath. Surfaces should then be oiled down with a mixture of vegetable oil and salt to ensure that water won't seep in before you next fire up the grill. When protected this way, even cheap barbecues can last for years.